Race fans can shift their holiday shopping into top gear at the 2018 End of Season Sale on Saturday, Nov. 17 at the Indianapolis Motor Speedway, with great deals available on a wide variety of IMS and INDYCAR apparel, collectibles and more. The sale features the lowest prices of the season and is open to the public from 9 a.m.-4 p.m. (ET) on the fourth floor of the IMS Media Center, located next to the Pagoda in the IMS infield. Customers should enter the track through Gate 2 and follow signs and directions to the Media Center. The best selection can be found on-site at the IMS Media Center, along with a superb view of the front stretch of the IMS oval. But selected sale items will be available at shop.ims.com. Tickets to all IMS events in 2019 also are an excellent holiday gift idea. Tickets for the 103rd Indianapolis 500 are on sale now at IMS.com. 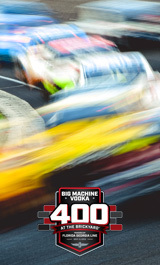 Tickets for the 26th annual Big Machine Vodka 400 at the Brickyard will go on sale soon. 2019 Tickets View Schedule Get the Gear!